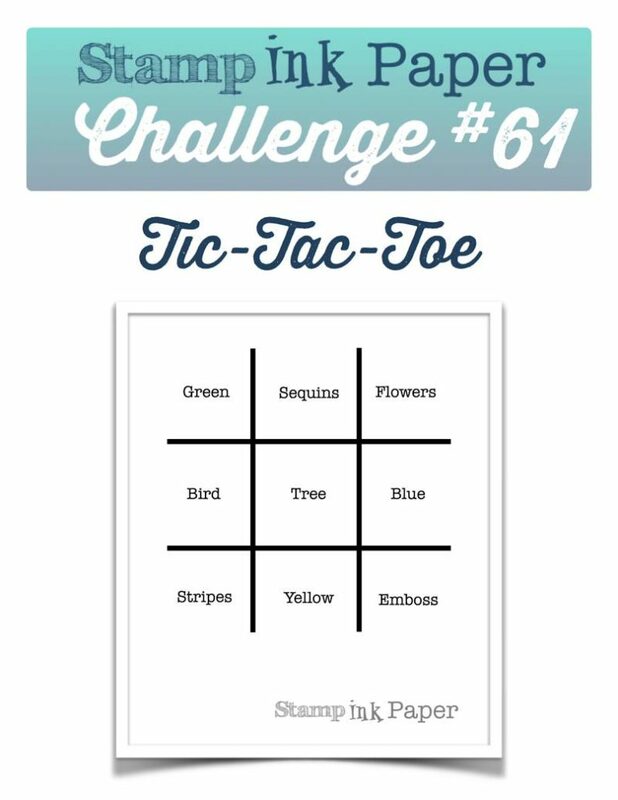 SIP Challenge 61 – Tic-Tac-Toe from Lisa! Home / Altenew / SIP Challenge 61 – Tic-Tac-Toe from Lisa! The weather was a little cooler here yesterday, it was in the 80’s and while the AC is thankfully still working in the car it was definitely a top down day! I had a nice day at the Stamp, Ink, Paper Store! I got lots of administrative things done in the morning. My friend Robyn stopped in to get some goodies and we had a nice long chat. She has lots of good recommendations for off beat things! I chatted with Sue and Skyped with Andrea and Dena! My ride home was lovely and quick! After dinner my friend Louis called and asked me to meet him at Century21 to help him pick out a suit, his grandmother passed away. Another excuse for a drive in the car! We got two suits for him and then stopped at Carvel and had a little ice cream. Today I have a lot to get done at the store and then tomorrow I have to start getting ready for Card Class on Thursday and Friday! This entry was posted in Altenew, Blog, Cards, Crafts, Embossing, Hero Arts, Mijello Mission Gold, Photopolymer, Stamps, Watercolor, We R Memory Keepers and tagged Altenew, Card Making, Crafts, Hero Arts, SIP Challenge. Bookmark the permalink. I think this us one of my Top 50 cards ever. I simply love it! Another beautiful card, Justin. 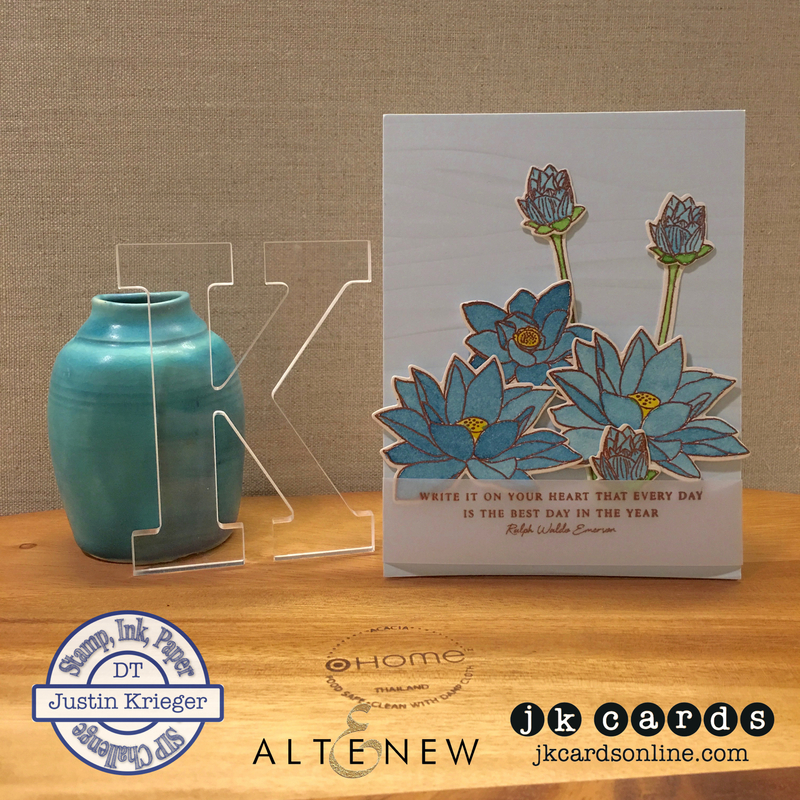 I love the copper embossing with your wonderful blue watercoloring. That sentiment is the best. On a personal note, I deleted a few hundred emails on Saturday and somehow when I do that I lose your blog. So I have not been able to find you until today. Now I can get caught up again. Don’t worry I have a more manageable number now – 1531 emails now. Isn’t that crazy!! I hate to get rid of things. I think I’m going to do some copper embossing today. Glad you got the AC fixed in your car. Have a great day! Justin – are you okay? Are you running a fever or sneezing or something? You actually had sequins on the Tic-Tac-Toe and didn’t use any on this card? Oh my, now I’m getting worried! 🙂 I’m so glad you introduced me to that copper embossing powder, it has now become my favorite. Your card for today is just beautiful (as always) and your water coloring and shading are perfect. I love that the embossing keeps the inks where they belong. Ha ha ha ha ha! You are too funny Grace! I thought about adding sequins but I didn’t think that it needed anything else! Even I can hold back sometimes! LOL! I love that Copper EP, it’s my new Gold! Thank you! Love the heat emboss and then watercolor, makes it a little easier! So pretty! Love the sentiment too!